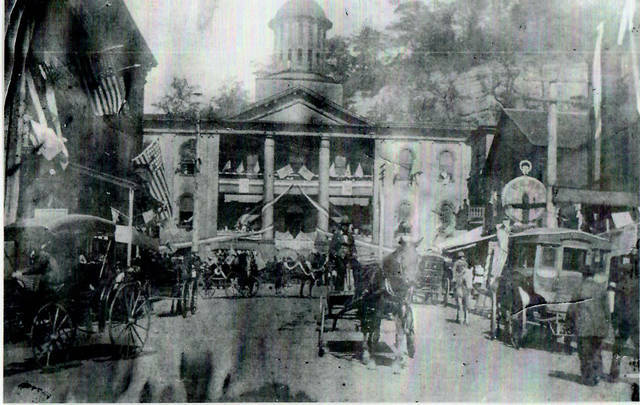 Court Street in Pomeroy was filled with people, flags, horse and buggies to mark an Independence Day celebration in the late 1800s or early 1900s. While cars have now replaced the horse and buggy, people still gather in villages, such as Middleport, Racine and Rutland, to celebrate Independence Day with parades and activities. https://www.mydailysentinel.com/wp-content/uploads/sites/14/2018/07/web1_7.5-Throwback-1.jpgCourt Street in Pomeroy was filled with people, flags, horse and buggies to mark an Independence Day celebration in the late 1800s or early 1900s. While cars have now replaced the horse and buggy, people still gather in villages, such as Middleport, Racine and Rutland, to celebrate Independence Day with parades and activities.